Short, nutritious, downloadable Bible Studies. Sister site to 1-Minute Bible Love Notes. I'd love to have you share on Facebook and Pinterest. You can use the small gray icon below each Bible study for this purpose. 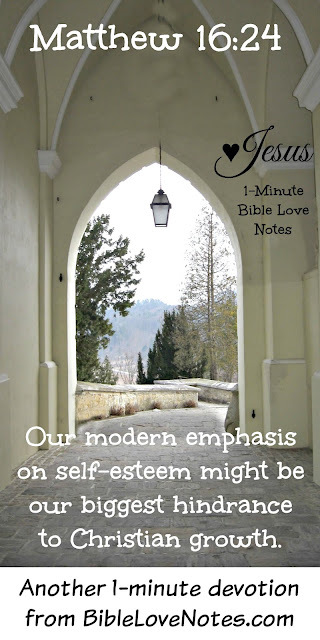 Our modern emphasis on self-esteem might be our biggest hindrance to Christian growth. Self-esteem teachings, with their focus on self, are popular with our fallen human nature (Ephesians 4:19-21). And despite the fact that they contradict Scripture, they've become accepted by many Christians and promoted in popular "Christian" teaching (2 Timothy 3:1-5). This means increasing numbers of professing Christians are telling themselves lies. Lie: God says to love others as I love myself, and I can't do that until I first love myself. Truth: This is a ridiculous interpretation of Mark 12:31. This passage is about fair treatment of others, not "feeling good" about others or about ourselves. 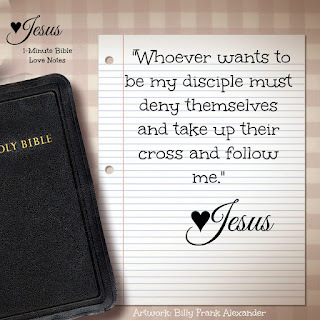 God says self-denial, not self-esteem, is the key to healthy Christianity (Matthew 16:24; Philippians 2:3-4; Romans 12:3). We should esteem God, representing Christ to a world of self-esteemers. When we do that, we end up feeling valued by the only One who matters. While the following passage is focused more on worrying about our day to day needs, it applies to focusing on anything other than God's kingdom. Read through it and identify the principles that apply to the self-esteem movement in our country. I've inserted questions in italics. Matthew 6: 19-34: “Do not store up for yourselves treasures on earth, where moths and vermin destroy, and where thieves break in and steal. 20 But store up for yourselves treasures in heaven, where moths and vermin do not destroy, and where thieves do not break in and steal. 21 For where your treasure is, there your heart will be also. 1. How might self-esteem be similar to other earthly treasures? How is self-esteem fragile, perishable, not a heavenly treasure? You can gain additional insight into earthly treasures in 1 John 2:15-17. 2. In these verses our eyes represent what we look on with value. How does valuing our self-esteem cause darkness in our hearts? 3. No one can serve self and serve God. It's not possible. One will always win out. What possible conflicts do you see for the Christian who wishes to feel good about himself or have others feel good about him versus the Christian whose first goal is to please God? See also Ephesians 5:8-12. 25 “Therefore I tell you, do not worry about your life, what you will eat or drink; or about your body, what you will wear. Is not life more than food, and the body more than clothes? 26 Look at the birds of the air; they do not sow or reap or store away in barns, and yet your heavenly Father feeds them. Are you not much more valuable than they? 4. We all want to be valued...and what better value can we have than the one God places on us undeserved - not because we are wonderful, but because He is wonderful! When we tell our children we love them because they are amazing, we encourage arrogance. Instead, like God, we should be telling them we love them because they are our children. 27 Can any one of you by worrying add a single hour to your life? 28 “And why do you worry about clothes? See how the flowers of the field grow. They do not labor or spin. 29 Yet I tell you that not even Solomon in all his splendor was dressed like one of these. 30 If that is how God clothes the grass of the field, which is here today and tomorrow is thrown into the fire, will he not much more clothe you—you of little faith? 31 So do not worry, saying, ‘What shall we eat?’ or ‘What shall we drink?’ or ‘What shall we wear?’ 32 For the pagans run after all these things, and your heavenly Father knows that you need them. 5. Even though many Christians have adopted self-esteem philosophy, it originated in secular psychology from men and women who had a low view of Scripture. It is "pagan." But we are not pagan. We are children of the King of Kings. 33 But seek first his kingdom and his righteousness, and all these things will be given to you as well. 34 Therefore do not worry about tomorrow, for tomorrow will worry about itself. Each day has enough trouble of its own. As we seek to esteem God, we will receive whatever significance God deems appropriate and good for us. I write Bite Size Bible Study and 1-Minute Bible Love Notes. 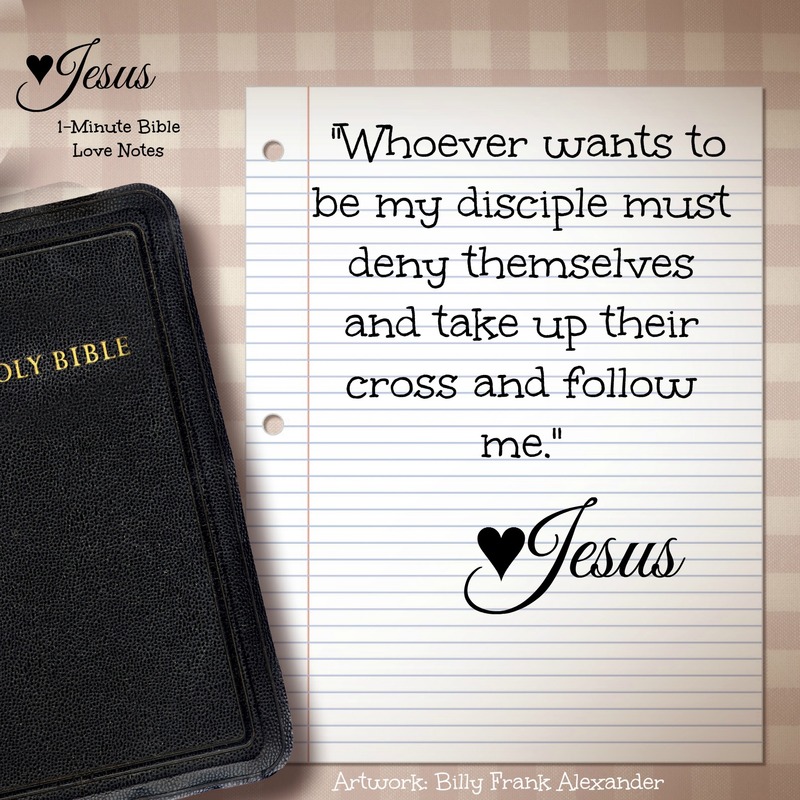 I'd love to have you join me on my journey to draw closer to Jesus!